Happy Independence Day! Here are 2012’s restaurant & eating freebies & deals roundup. All deals are valid for the 4th only, unless otherwise stated. Have a safe 4th of July! Hooters: 20 boneless wings for $9.99. Tax not included. Boston Market: 50% off any Family Meal with a printable coupon. Carl Jr’s./Hardee’s: don your Spiderman costume to receive FREE Bacon Burger. Offer valid for the first 50 participants per store only. Minimum requirement for the costume is a t-shirt. Jamba Juice: FREE menu drink with the purchase one with this coupon. A full list of participating locations in NY, NJ, and CA can be found here. Firehouse Subs: FREE Medium sub with purchase of a sub, chips & medium drink. Papa John’s: 50% off regular priced online order with code party50. Can not be used in conjunction with other specials or offers. This offer may be regional; check before ordering. Romano’s Macaroni Grill: “like” Romano’s on Facebook to snag a coupon for BOGO entreé. Chili’s: Buy an adult and receive free chips & queso with this printable coupon. Caribou Coffee: 2 medium drinks for 4$. Save your July 4th receipt and get 50% off the rest of the week July 5-8th. 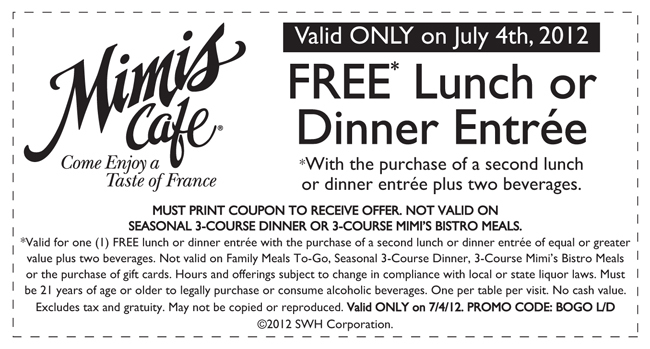 Mimi’s Cafe: Free lunch or dinner entree with the purchase of one plus two beverages with this printable coupon. Arby’s: FREE small fry & small drink with purchase of a Market Fresh sandwich. Must provide name and print out coupon. Valid through July 9th. Friendly’s: BOGO 3 scoop sundae. Expires July 8th. Del Taco: FREE macho beef taco with the purchase of one. Denny’s: FREE smoothie with purchase of any entree valued at $2.50 or more. Bob Evans: $4.99 all you can eat hotcakes. Valid for a limited time only.